The Vietnamese dong (VND), Vietnam’s official currency, come in polymerized notes with multiple zeroes: VND 10,000 is the smallest bill you'll find on the street these days (coins of as low as VND 200 have long been phased out), with the upper limit hit by the VND 500,000 bill. At the present exchange rate (between 20,000-21,000 VND per US dollar), changing a fifty-buck note gets you 1.138 million dong. Ka-ching. Getting a grip on all those zeroes can be challenging for the first-time visitor to Vietnam. With a little time and practice, buying and spending Vietnamese dong becomes second nature to the Vietnam visitor. Major currencies can be exchanged practically anywhere in Vietnam, but not all exchange facilities are created equal. Banks and airport moneychangers can change your money at a high cost relative to a jewelry shop in Hanoi's Old Quarter, so it pays to ask around before trading dollars for dong. Banks. The government-run Vietcombank can exchange dong for US dollars, Euros, British Pounds, Japanese Yen, Thai Baht, and Singapore dollars. Banks in major cities like Hanoi and Ho Chi Minh City will let you change foreign currencies and most travelers' checks. You'll be charged a commission rate of between 0.5 to 2 percent for the latter. Always bring new notes; any damaged or dirty notes will be charged an additional two percent of the note's face value. Hotels. Your mileage may vary with hotels: larger hotels can offer rates competitive with banks', but smaller hotels (like those in the Old Quarter of Hanoi) may tack on an additional fee for the service. Gold and jewelry shops. The rates in these mom and pop establishments can be surprisingly fair, with no fees (unlike those in hotels and airport bureaux de change). Shops in Hanoi's Old Quarter—particularly Hang Bo and Ha Trung streets—offer better deals, as do gold and jewelry shops in Ho Chi Minh City's Nguyen An Ninh Street (near Ben Thanh Market). You're certain to find an ATM to withdraw from in any of Vietnam's major cities, but smaller towns have also begun to bring their A-game. That's not guaranteed, though, so it still makes more sense to withdraw in the cities before making your way out to the boondocks of, say, Mai Chau. Are ATMs better than changing dollars at the airport? It really depends who you ask. If you're spending more than a few days in Vietnam, changing all your money to Vietnam dong increases the risk of theft: one robbery and you'll be broke till the end of your trip. Some will say that the peace of mind that comes with just withdrawing every couple of days from an ATM is worth the withdrawal fees charged. Fees and charges vary: ATMs near backpacker districts like Pham Ngu Lao in Saigon reportedly charge an extortionate rate of three percent on top of your usual bank charges. More reasonable fees may hover down to about 1-1.5 percent per transaction. 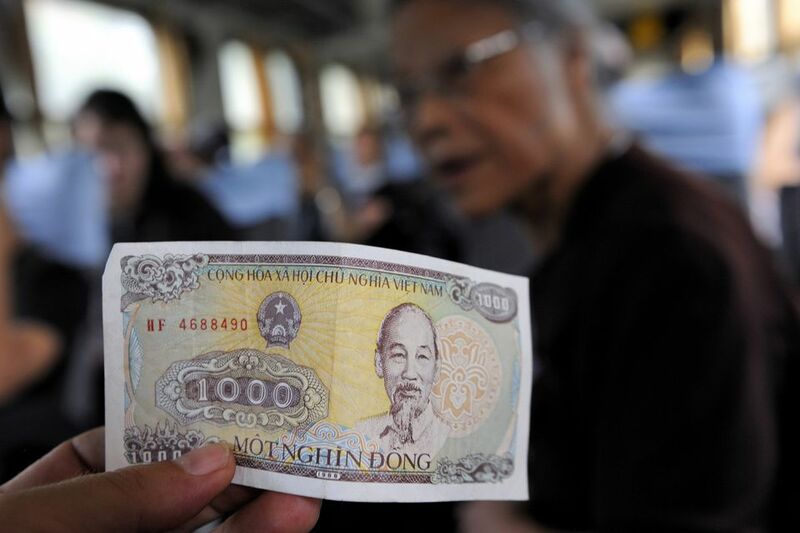 Banks allow a maximum withdrawal of between VND four million to VND nine million, dispensing 50k- and 100k-dong notes. As millions of dong can add up to a thick wad of cash, be careful when withdrawing large amounts from an ATM. Cash rules in Vietnam, though credit cards are accepted in many restaurants, hotels, and shops in Vietnam's big cities. Visa, Master Card, JBC and American Express are the most common credit cards honored in Vietnam. You can use ATMs to get cash advances on your credit cards; in a pinch, you can visit Vietcombank to get an advance over the counter. For credit card transactions, you may be charged an addition 3-4 percent per transaction. Can US Dollars Be Used? Not very often. Shops that used to accept payment in dollars are now obliged to ask for payment in the local currency only. You're better off exchanging your money at banks or other authorized currency exchange centers. Besides, paying in Vietnamese dong gets you better value than paying in dollars. Better to spend day-to-day using VND, while keeping a stash of dollars around for emergency purposes only. Do You Need to Tip in Vietnam? Not really. Major hotels and restaurants in Vietnam add a 5% service charge to bills, so you can choose not to tip at these places. Elsewhere, small tips are always a good thing. Waiters, hired drivers, and guides should be tipped. Restaurants and bars: Many restaurants don't require tipping, as a 10% service charge is already tacked onto your bill. Porters: A tip with American coins will be greatly appreciated. Hotel Services: Government-run hotels will add a 10% service charge on your bill. Taxi: Tips aren't necessary, but a small gratuity will be greatly appreciated. There’s one golden rule to shopping in Vietnam: bargain, and bargain hard. “Fixed prices” at most tourist shops aren’t really fixed at all; the listed prices are about 300% higher than the last price you can pay if you dicker long enough. Bargaining is an exacting discipline, and quite exasperating for the novice traveler who’s not used to the grueling back and forth. And Vietnamese sellers aren't exactly the most cheerful bargainers. In areas with high tourist traffic, sellers sometimes refuse any attempts at bargaining down, knowing that there will always be another tourist willing to pay the prices they quote. So, in Ho Chi Minh City, sellers at Ben Thanh Market (high tourist traffic) will gouge you hard, while their counterparts at Russian Market (low to middling tourist traffic) will give you some leeway. It all boils down to: you're a tourist, pay tourist prices. The only effective way of avoiding the “foreigner tax” is to get a Vietnamese friend to haggle on your behalf. Budget travelers in Vietnam can expect to spend up to $25 a day on food and lodging. Middle-budget spenders can enjoy good restaurant food, hire cabs, and stay comfortably in good hotels for about $35-65 a day. To keep costs down, eat street food for every meal; it's not just good money sense, it's an experience you shouldn't miss when in Vietnam. Street food in Hanoi is exquisite, worthy of Presidents and international TV hosts, at a surprisingly low cost. Domestic air travel has become significantly cheaper, with the advent of VietJetAir (Vietnam's only budget airline) competing with full-service airlines like Vietnam Airlines and the “Reunification Express” train service. Don't mistake one bill for another. As if the multiple zeroes aren't confusing enough, some VND denominations can look very similar to the untrained eye. Many tourists have overpaid with VND 100,000 bills, mistaking them for the similarly greenish VND 10,000. Warning: polymer notes stick. The 2003-issue Vietnam dong are made of long-lasting polymer, not paper: and these plastic notes can stick together, presenting another risk you'll overpay for your goods. Flick or peel your notes carefully when paying for a purchase. Avoid paying in high-denomination bills. Very few vendors will willingly change your VND 500,000, so make sure you're carrying smaller bills when going shopping. When visiting a pagoda, leave a small donation just before you leave. What Are All the Transportation Options in Hanoi?